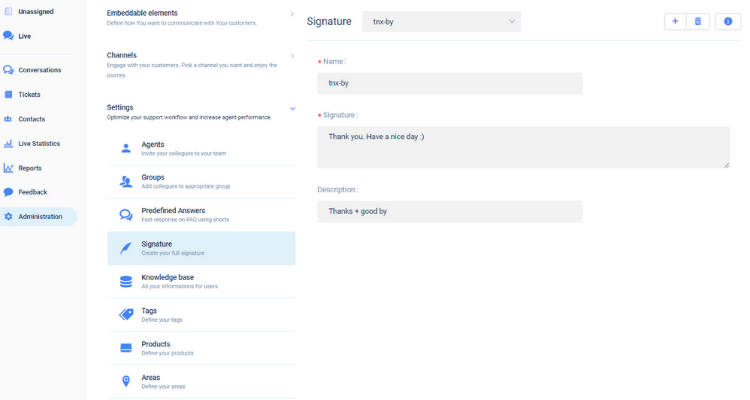 Signature allows you fast response to customers usually at the end of conversion. It represents your unique text that represents you and your company in one way. It can be fully created as you wish for you as well as for your staff. After entering the Paldesk application, navigate through Administration and inside Settings click on Signature. 3. Description – for team purpose only. In order to create new ‘Signature’ click on white add content button in the upper right corner. Fill in the required information and click on Save to finish creating your Signature. Also you can delete your Signature by simply clicking on the trash can icon in the upper right corner next to the add content icon and confirming your choice by clicking yes afterwards.